After yesterday’s stage 9 was cut short by the difficulties experienced by all teams, today’s stage went as planned. The stage 10 was set in the sand dunes of Fiambalá, which is the longest dune section in the shared history of the Dakar. This means that the drivers had to prepare for sand driving and organizers had used special starting order; the ten fastest cars, the ten fastest motorbikes and the five fastest trucks will start together to lead the way for other participants. The overall winner in the car class was Stephane Peterhansel with his perfect driving, and right from the very start of the stage, the Peugeot driver showed that he is the king of the desert. In contrast to his stellar performance, all other Dakar favorites had problems and event went stranded in the sand and did not finish the stage. 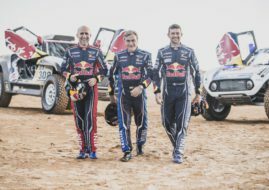 The defending champion, Al Attiyah stopped in the middle of the stage, but he managed to continue the race and even finish second behind Peterhansel. Sebastian Loeb also had problems with getting stuck in the sand but managed to continue the race after he lost 10 minutes. But Carlos Sainz had the worst day since he suffered mechanical failure of his Peugeot (broken strut between the engine and the gearbox) and he was unable to continue the race. He was even left behind waiting for assistance crew to repair his car and get him back into the race.